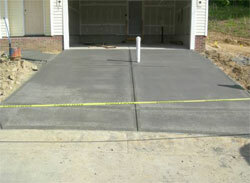 A day after the forms are laid for the driveway, sidewalk and patio, the concrete is poured. The concrete crew finishes the surface nicely. The mere mention of the word 'concrete' alone stirs up images of something that is in reality, tangible, and long lasting. This holds true for concrete, which is the most commonly used material in the construction of all sorts of infrastructures. Even buildings made by ancient civilizations out of concrete have stood the test of time, thus proving the sturdiness of concrete as a material for building. However, like all types of building materials, concrete is not entirely impervious to degeneration, especially when many years have passed since its installation. Which is why there is still a need for maintenance, despite the popular belief that concrete is a surface that does not need maintenance. Not only will maintenance keep the concrete surface tidy and appealing, but it would also prolong the life of the surface, making sure that it stays true to its billing as something that will stand the test of time. Degradation is not the only problem that rears its heads in the direction of concrete surfaces. There is the constant problem of stains getting in the concrete surface, as well as debris, oil, grease, rust, and even vandalisms such as graffiti. These stains will render the previously smooth concrete into a grimy and uneven surface. The easiest dirt and stains, such as debris, oil, and grease, can be easily removed by rinsing them with a garden hose or by using materials such as leaf blowers, or by merely using water through scrubbing and using a brush. Cleaning concrete surfaces at least once in a year can also help in maintaining its cleanliness, as most stains will be more difficult to remove as time wears on. Using water to clean stains and debris from a concrete surface is the most common method of maintenance, but there are other chemicals, which could be used for the more stubborn stains and dirt, such as vandalisms, oil, and tire-marks. Stronger brands of soap as well as ammonia are the first chemical that could be used to aid in the cleaning of the more stubborn stains on a concrete surface. If the stain, however, would still refuse to dissipate even with the use of these chemicals, then the method of power washing coupled with the use of chemical cleaners such as alkaline degreasers might be necessary. For the problem of rust stains, which can arise when the concrete surface is reinforced with steel bars that have the tendency to corrode over time, the preferred chemical cleaner would be those which contain oxalic acid, as it counters the rust which seeps deeply into the concrete. Finally, graffiti may be the most difficult of stains to remove from a concrete surface, which is why special chemical cleaners, such as potassium hydroxide, methylene chloride, or any citrus-based solvent should be used. Another means of prolonging the life of a concrete surface would be to use sealants that would repair the cracks and prevent water from seeping through these cracks in any concrete surface, thereby extending the life of the concrete by approximately one to five years. Concrete sealants are available in two finishes, matte and high-gloss and, fortunately, they can be applied without the aid of a contractor, although supervision is still advised. Prevention is indeed better than a cure, as the adage goes, and it applies in the case of concrete surfaces, which need maintaining. The simple washing and mopping of concrete surfaces from time to time would certainly go a long way and would avoid the arduous task of power washing or the hiring of contractors. Not only could hard-earned money be saved, but the life of the concrete surface would also be prolonged.